Remember that there are many kinds of laws. There are spiritual laws, natural laws, and man-made laws. 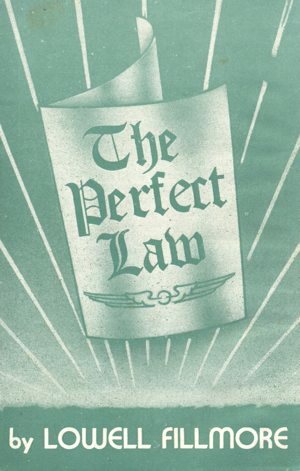 But underlying and supporting all of these is the great divine law, and "the law of Jehovah is perfect." Give me understanding, and I shall keep thy law. Here is indicated the receptive attitude that should be taken by the man who would operate in accord with the great divine law. The law of God is perfect while it functions in its spiritual realm, but when it is applied by men to their affairs in the world it works for them there only to the extent that they work with it. One who would have the full benefit of this perfect law must lift his consciousness up from a personal to a spiritual level. He must learn to rise in thought above worry as regards the outer things of life so that he may discover the spiritual seat of control over such things. He must establish through faith an agreement between his own spirit and the Spirit of God. Working perfectly with the divine law so as to cause it to act beneficently in his life is man's greatest privilege and joy. The divine law can work in man's affairs successfully only when the Christ Spirit in him rises and molds his thoughts and emotions into harmony with the spirit of that law. Jesus taught us to pray, "Forgive us our debts, as we also have forgiven our debtors." The divine law brings us forgiveness when we open the way by practicing forgiveness We are beyond the help of the forgiving law until we lift ourselves into its realm by forgiving those who have trespassed against us. Jesus taught that we should forgive a man an unlimited number of times. Such a practice is not so much for the benefit of the person we forgive as it is for our own It is rather a practice that frees us from the ignorance that causes us to be unforgiving, and at the same time it opens our being so that we can receive the great, forgiving love of God. Jesus said that when a person who is about to offer a prayer finds that he is hold ing anything against his brother, he must forgive his brother before he prays. Jesus taught that we should be more eager to give than to receive, and that by this method we should comply with the lav. of abundance that supplies us with all things in full measure, pressed down, shaken together, running over. This is how the divine law works in the affairs of men. Jesus also taught that it is more blessed to give than to receive. Jesus' idea was that in various ways man could discipline his spirit so that it would become free from the little, limiting mistakes of human reasoning and he would be able to understand greater and more useful spiritual ideas. The man who has failed to develop his eyes of faith to behold God's everywhere present spiritual abundance often becomes panicky when he sees only a meager supply with his physical eyes. As we grow stronger in spiritual understanding we become better able to behold God's great abundance as everywhere pres ent. Then we realize how foolish it is for us to try to obtain our good by employing methods that wear us out and destroy our happiness. God has provided an abundance of good things for all who will operate in accord with His law. Our health, happiness, and love are also closely dependent upon our observance of God's law. To improve our health we must realize its relationship to the perfect divine law; and that God is more willing to give us good health than we are to receive it. When we do not understand that God is our health we often fearfully tie ourselves into knots; for we worry, complain, and are afraid. These emotions prevent the divine forces from renewing our body. We also sometimes limit the source of our happiness to certain material things that we may be able to obtain, but doing so prevents us from finding the inner joy that comes direct to us from God. After we know how to receive it from God we can instill it into all the conditions that come into our life, and by its help we can make them pleasant. Love is another blessing that comes to us from God. No one can feel love until he expresses it. The divine law provides that we must practice the divine qualities before we can profit by them. The law of the Lord is perfect, and it transcends all other laws. The person who lives according to the divine law need not fear any man-made law, nor need he transgress the laws of nature. The law of the Lord is written in our heart. We do not have to go into a faraway heaven to find it. When we open our heart to it it is ready to work with us. But if we feel that we must get happiness, love, and forgiveness through the exercise of our personal will we shall not be able to receive the full co-operation of the perfect law. Earthly things are important when they are in their right place, but that place is secondary. The things that we need to eat and wear are not the most important things in our life. This is whiat Jesus meant when He said, "Seek ye first his kingdom, and his righteousness; and all these things shall be added unto you." Unity — Our oldest publication. It aims to teach Christian healing and Christian living. Charles Fillmore is a regular contributor. Daily Word — Carries a daily page lesson, also special articles and poems. Should be given a place on the spiritual program of every Truth student. Weekly Unity — An eight-page periodical presenting a simple, helpful message of practical value. Comprises short, pointed articles in addition to a number of popular weekly features. Good Business — A monthly magazine that teaches business men and women to think in terms of prosperity and success, through the application of Truth principles. Progress — An illustrated monthly magazine; carries fiction based on Truth; inspirational articles, and other constructive features. Wee Wisdom — For boys and girls. Its purpose is to build character while providing constructive entertainment. A fascinating, colorful magazine. All Unity periodicals at $1 a year each. 917 Tracy, Kansas City 6, Mo.